What a handsome little guy Talen is, and his brother Treyton, equally handsome, loved the camera! Talen was celebrating a birthday soon, so what better time for a photo session? It may have been a birthday session for the littlest Kiser gentleman, but the whole family got in on the fun. Talen wasn’t too excited at first but once he turned on the charm we got a TON of amazing images. He’s absolutely precious, this whole gang was a dream to work with! I look forward to many more sessions with this crew! Talen and the rest of the Kiser family with Little Crow! If you would like to book a family or children’s session with Little Crow just give me a call or send me a message via any method listed under my contact information tab at the top of the page! Renia contacted me because she wanted a snow session; and although we just couldn’t quite get the weather to cooperate, it turned out beautifully nonetheless! I am so happy for these two! They just welcomed baby Mila and boy is she gorgeous just like her parents! Renia had some awesome ideas, and the dress was to die for, how could we go wrong! The session took place on their property where their future home will be built, which I adore. Renia’s session was a combination of casual/lifestyle maternity and a glamorous couture based session with one of my custom made maternity gowns. Absolutely stunning! She is a vision in red! Check out some of the shots from Renia’s session with Little Crow. She ended up choosing the silhouette shot as a large printed canvas wrap which I just received and can’t WAIT for this momma to get it! 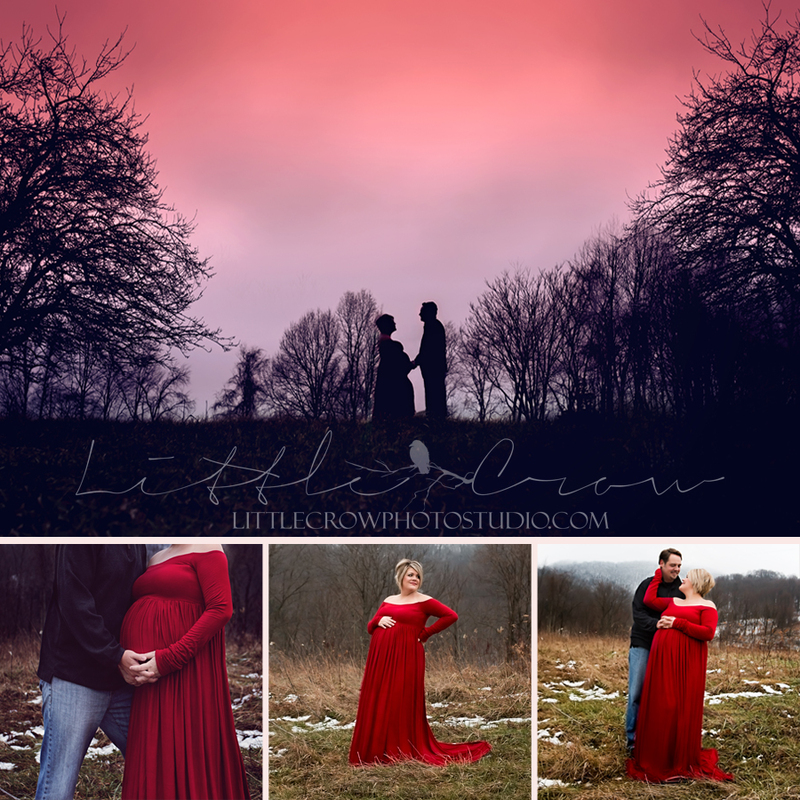 If you or someone you know is pregnant and would like more information on a Maternity Session with Little Crow, follow the link or contact me via any of the methods listed on the Contact Little Crow tab at the top of the page.